My Christmas gift to both of my grandmothers this year will be tins of homemade cookies. They keep telling me they don’t want or need anything, but everyone likes cookies. 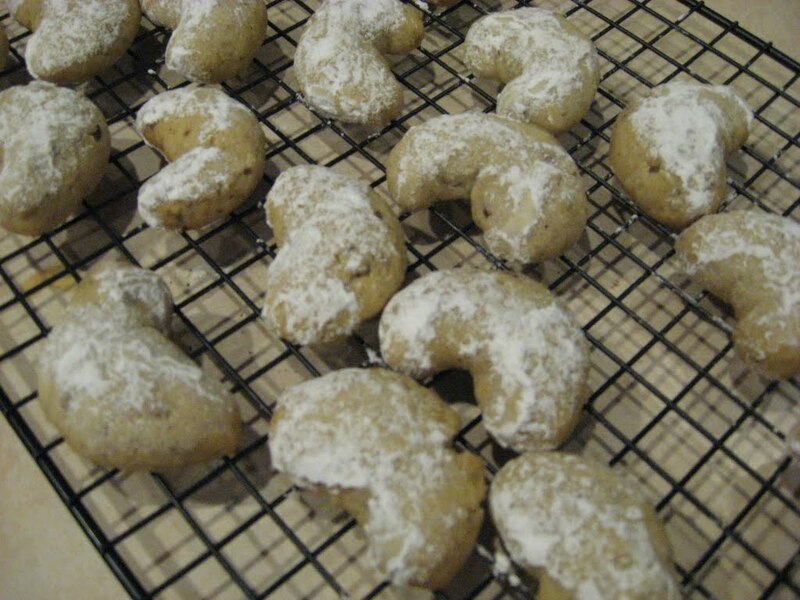 Mom told me that Grandmaman’s favorite cookies are pecan cookies, so I did a little hunting for a good recipe online, and came up with these “wedding cookies”. They’re traditionally an almond-based cookie, but I substituted toasted pecans and they turned out wonderfully. I’m transcribing this recipe into my book immediately so I don’t lose it! Toast the pecans by putting them in a single layer on a cookie sheet or pie pan, and baking at 350 for 8 minutes, stirring them at the halfway point. Put them in a large ziplock bag and crush them with a rolling pin, or do what I did and put them in a cup and smash them with the end of my smallest metal measuring cup. I guess you could dump them in a food processor, if you have one of those. You want them ground pretty fine but with bits big enough to give a crunch. Cream butter and granulated sugar, add vanilla and water and mix well. Add the nuts and flour, mix until blended. Chill 30 min in the fridge. Roll dough into balls and then squeeze into crescents (you can leave them as balls if you want) and place on ungreased cookie sheet. Bake 15-20 minutes at 350, then move to a rack to cool. When cool, dip the tops in a bowl of powdered sugar. This makes about 4 dozen cookies. I absolutely loved these. I want to make a second batch for myself but I’m getting tired of all the baking, and I also know I’ll be eating a ton in the next week, with the special Christmas Eve dinner I’m making, Christmas dinner with the in-laws and then with my Mom… so I’ll skip the cookies for now. But I’ll be baking these again in the near future, I think. This entry was posted in Uncategorized on December 23, 2010 by antijen. This is almost exactly my great-grandmother’s recipe with a few tweaks 🙂 They are yum! !